Yes. I am very late to the party. But at least I made it. Much like our protagonist Katniss Everdeen, one cannot escape THE HUNGER GAMES. THE HUNGER GAMES by Suzanne Collins is a gripping trilogy set in a future where today's North-America is no more; the Capitol rules the 12 districts of Panem, and to punish them all for defying the Capitol once in an uprising (so violent, the thirteenth district was eradicated) every year the Capitol organizes The Hunger Games, a nightmarish Survivor type scenario set in an arena, where no one gets kicked off the island exactly, rather is murdered by another contestant, a "Tribute". All this to remind the 12 remaining districts that the Capitol reigns supreme. I can see why these books are so widely read. Their subject is unusual. But what makes THE HUNGER GAMES actually defiant of convention, is that these Tributes, these 24 people chosen to fight one another to the death until only one of them remains, are between the ages of 12 and 18. Children, one boy and one girl per district, forced to kill or be killed. The whole thing is televised, a twisted Truman Show for the Capitol's pleasure… while it is required viewing for the 12 districts, forced to watch their children survive by killing one and other in an arena, for entertainment. THE HUNGER GAMES's first book of the same title introduces us to Katniss, 16 years old, from the poverty stricken Seam in District 12. She spends her days hunting the forest (illegally) to take care of her mother and younger sister, Prim. Thankfully, she's good with bow and arrows, finding regular game to trade or bring home to the table. 'Thankfully', she knows how to be hungry, how to survive. 'Thankfully', because on the day of the Reaping, the unexpected happens: Katniss, in taking the place of Prim, becomes one of the two Tributes for the 12th district. THE HUNGER GAMES is very, very violent, but Collins does a good job showing, not telling. She doesn't describe in endless detail what happens to the kids. It's not all gore and muck. A lot of THE HUNGER GAMES actually deals with solidarity and conscience. What matters are those precious tender moments (Rue's song). Rebellion, caring for others, sacrifice – in life or death situations. THE HUNGER GAMES is about senselessness, and it's a hard read, but it's not without hope. The book is really is about survival and strength. Another major strength of THE HUNGER GAMES is how well the dystopian world is developed. I loved Katniss' descriptions of District 12 and life there (The Hob, hunting with Gale, her mother's medicine). What I found to be equally alluring is how the Capitol's people look: magenta hair, turquoise skin, golden tattoos all over. A great dichotomy: the Districts bleak, poor, colorless; the Capitol a colorful and greedy extravaganza. Panem and its districts are more than sufficiently detailed to make a convincing impact on the reader. I could picture it all only too well, and while it's a scary thought, it's a necessary one. Humans, we're bent on self-destruction. I sometimes worry about the world 100 years from now. Naturally this book is a criticism of how we conduct ourselves. A possible outcome. Dystopias are by definition harsh, but this one is the cruelest I've ever read about. 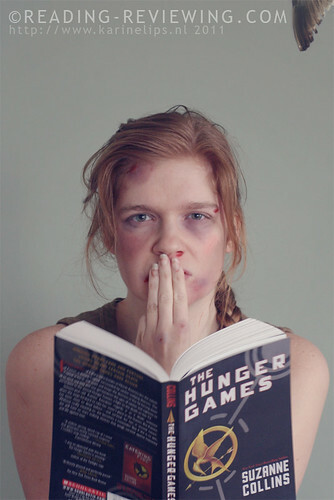 THE HUNGER GAMES affects the reader tremendously due to the glimpse Collins offers us. A glimpse into something horrible, something self-created. THE HUNGER GAMES also criticizes the media, in a sense. The Games, televised as they are, is an utter media circus: Gladiators of the future. Kids are being sent to their death, but they're going (out) in style: Katniss has a team of stylists, and there's all kinds of prepping for interviews and what not. This irritated me at times, but then I realized, of course, that it's supposed to irritate me. Naturally, there is a love triangle between Katniss and two boys, one of whom is in the Games with Katniss. I found this to be a little bit unnecessary personally. The reader instantly senses which one it's going to be. Furthermore, Katniss and Peeta, the male district 12 Tribute, engage in a faux relationship as a tactic for the games. I'll probably be in the minority here when I say that this whole set-up is utterly ridiculous. (I'll use one of my favorite words: cringeworthy.) Collins went too far with their "made up love affair", and it took away from the real moments, which were there but which were tainted. Everything became forced, except perhaps Peeta's feelings. I was convinced of their genuineness throughout. But it wasn't quite enough. Katniss and Peeta as a couple (real or fake) underwhelmed me, but as individual characters they are very strong, especially Katniss. Her voice is very collected as she describes the horrors she and others endure. Katniss has to be one of the most admirable young female heroines that we've had in fiction for a while. I do wish she'd been more emotional at times – any reaction to the situation – but she's trying to be brave and hold it together, and I can accept that. Katniss really takes you with her into that arena. The use of the present tense is most effective in that sense, and well played by Collins. It only increases the build-up of tension; you want to know what happens next, all the time. Needless to say, I could not for the life of me stop reading this. I started, stayed up until well after 2AM, which is when my eyelids protested heavily against my adamant reading session. I picked it up immediately the next day, and didn't stop until I was done. This book completely swallowed me up, that's how enthralled I was. I instantly regretted not having the other two books in the trilogy handy. I of course ordered them straight away, then. Good thing too, because while THE HUNGER GAMES does have somewhat of an ending, it's obviously part 1 of a bigger story. So if you're going to read THE HUNGER GAMES, you might as well get the box set. Trust me on this. It doesn't much matter if the other books are better or worse. You don't want to be left hanging. – Excellent pacing. Can't put it down. 1. After I read the whole trilogy, I learned about a novel called BATTLE ROYALE, which covers a lot of similar ground. Very similar. BATTLE ROYALE was written in '99, prior to THE HUNGER GAMES, and Collins has been accused of ripping off BATTLE ROYALE. But I don't know the facts. I won't jump to conclusions. I haven't read BATTLE ROYALE. I've read THE HUNGER GAMES, and I've never read anything like it. And that is how I will review this series. THE HUNGER GAMES is being adapted into a movie. Of course. It will star Jennifer Lawrence (WINTER'S BONE) as Katniss, Josh Hutcherson (THE KIDS ARE ALRIGHT) as Peeta and Liam Hemsworth as Gale. I personally was rooting for Lyndsy Fonseca (for Katniss) and Hunter Parrish (WEEDS; for Peeta), but think Lawrence can pull it off and I'm willing to give Hutcherson the benefit of the doubt after seeing him in THE KIDS ARE ALRIGHT. Nothing wrong with being late in the game. I finished the first book just an hour ago! 🙂 And yes, it swallowed me too, what a great read! As to the movie, my daughter is VERY disappointed about the casting so far. I hope the final result will prove her wrong! 🙂 Thinking about admirable female heroines, Lisbeth Salander comes to mind but Katniss is certainly in the same league. I enjoyed your review! Hee! Well, the casting, I will just give them the benefit of the doubt even though of I also did prefer other people in the roles. (Whom did your daughter have in mind?) Oh well, I'm sure it will be a great production nonetheless. Ah yes, Lisbeth Salander is an excellent example of another heroic female in literature. Katniss is a lot like her. Haha! My daughter showed me that, when you search on YouTube: "My Hunger Games Cast" you get quite a lot entries by fans who show their favourite cast (you'd probably allready seen it). Great, innit? The anticipation, the fun of thinking how the movie could be! I recognized Elizabeth Banks when I googled her, but I must say she didn't make a lasting impression on me. That might change with this movie. Certainly planning to read the rest of the trilogy. Looking forward to your review! I should write something about Wolf Hall, which I liked a lot. Maybe I will! I just read all three books recently, and a lot of what you wrote has articulated most of my opinions about the book. About the movie, I think that the book *could* be done really well, but for me, my main concern is that they will use older actors, which would be disappointing as much of the shock comes from these really young children killing each other.I expect many people have concerns about the movie, and it will be hard to make one that doesn't disappoint the big fanbase the books have.